As we prepare to kick off Sabbatical 2.0 we started taking a look at what vaccinations and immunizations are recommended for an International traveling family. What were the risks and what could we do about them? Living for an extended period of time in a foreign country comes with some risks especially when traveling with young kids so it’s important to take a look at the information for whatever country you may be traveling to. But one also needs to take a good hard educated look at the risk and decide whether that risk is important enough to mitigate with vaccinations and immunizations or other methods. Insurance would cover the standard immunizations like MMR, Hepatitis and Tetanus but the rest would come out of our own pocket and for a family of 4 that totaled almost $7000. Side rant: It always amazes me how short sighted insurance companies are. They refuse to cover travel vaccinations but will cover treatment for whatever illness you may contract while traveling, illnesses that could have been prevented with vaccinations that cost a fraction of the treatment. After the sticker shock started to wear off I started to wonder if all of these were really necessary or were these recommendations more sensationalized salesmanship. First, we don’t have $7K to spend on vaccinations. This is almost double what our round trip airfare cost! But then I started thinking about what is a life worth. If one of of my kids were to contract an illness that could have been prevented by a simple vaccination how would I feel? The $7K would seem like pocket change at that point. So what were the real risks of contracting things like rabies, JE and malaria in the areas we planned on traveling to? Did those risks warrant spending $7K on travel vaccinations? Should I view travel vaccinations from a cost-benefit ratio or a risk-benefit ratio? After doing our own research of the risks and talking with a few people experienced with International travel we decided on the following. MMR – Both the kids are up to date on this standard childhood immunization. I don’t know when I had my last update so I will probably be getting this through my employer. Tetanus – Again our kids are up to date on this as it is a standard childhood immunization. I have no idea when I last received one so I may opt to get this one as well. My wife had one a few years ago after putting a knife through her hand while trying to remove an avocado pit. 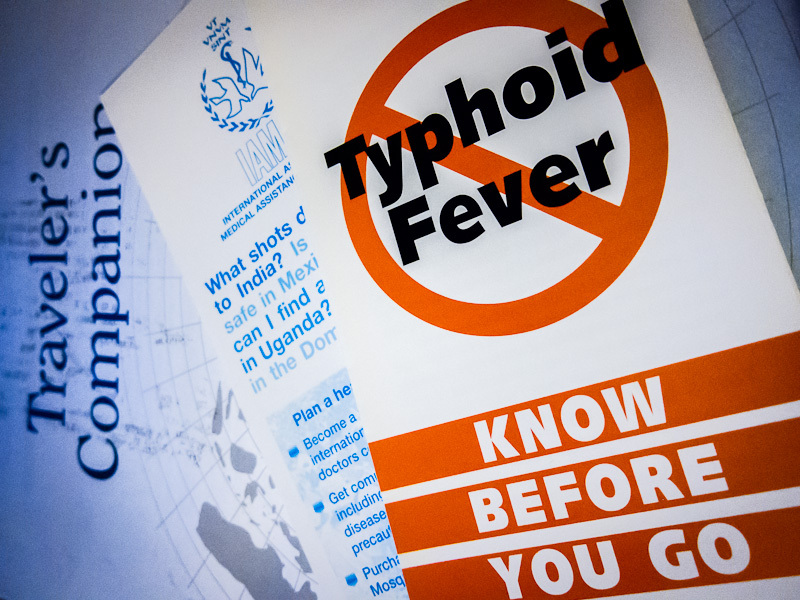 Typhoid – We all plan to get this vaccination. It’s relatively inexpensive and involves taking a series of 4 pills of active attenuated vaccine. The pills are taken on an empty stomach every other day. Because it is live vaccine they must be kept refrigerated. The side effects are minimal. There is also an inactivated injectable version of this vaccine. The shot provides protection up to 2 years whereas the oral pills provide 5 years of protection. We decided to get the typhoid vaccine because the cost/risk ratio just made sense. Japanese Encephalitis (JE) – We discussed this vaccination and decided to not get it. For one it’s really expensive. It’s a 2 shot series that cost $300 a shot ($600 per person). While JE is endemic throughout the year in Indonesia we didn’t feel the cost/risk ratio made sense. We will mainly be in urban areas where the risk is said to be lower. Rabies – Rabies is nothing to mess around with. It is fatal if you do not seek and receive prompt and proper medical care. We will be in Bali where there have been reports of rabies mainly through the bite of dogs. Our main concern is that with kids they tend to gravitate toward animals like dogs and monkeys. There is an increased risk of a dog or monkey bite. The concern with kids and bites is that often they will get bit and not tell anyone. The rabies vaccination is not cheap. It consists of a series of 3 shots at $300 each ($900 per person). Afterwards if you are exposed to the rabies virus you will need to still seek treatment and receive another 2 doses of vaccine. This was a tough one but we decided to not receive this vaccine. We plan to keep a very watchful eye on the kids and instill in them an awareness to stay clear of strange dogs and aggressive monkeys and bats and to let us know immediately if they get bit. Hepatitis A & B – The kids have received both of these immunizations as part of their regular childhood immunizations. I don’t have very good records of my own hepatitis immunizations so I may opt to receive this as well. It’s possible I have received this at work and I am having them check their records. Malaria – We will be in SE Asia during the wet season so malaria is a concern. We will be primarily in urban areas where the risk is said to be low. We never took malaria prophylaxis for the two months we were in Indonesia back in 2005. Since we don’t know our full itinerary at this point we may opt to get prescriptions for Larium (Mefloquine) and use it if/when we travel to more remote areas where malaria would definitely be more of a concern. Malaria is not the only disease transmitted by the bite of a mosquito. Dengue fever and JE are two diseases that mosquitos can transmit. This brings up the point of taking steps to mitigate getting bit by mosquitos. Utilizing mosquito repellant, clothing and spraying the areas we will be staying at are things we can do to reduce this risk. It is the wet season however so this may be a losing battle. Traveler’s Diarrhea – Of course no extended trip would be complete without diarrhea. I’ve had this on every International trip I’ve taken. Sometimes you just can’t avoid it. We will be procuring a variety of antibiotics (Trimethoprim, Cipro) to treat ourselves should a ‘few days of diarrhea’ turn into something more serious. Of course being cautious with the water you drink and the food you eat are important in avoiding and reducing the likelihood of experiencing diarrhea. We are pretty comfortable with our decisions. While we would love to be able to protect ourselves from all the risks, financially it’s just not possible. One thing we will be doing is checking out the cost of these vaccinations in SE Asia and seeing if it’s feasible to get them done once we arrive. From what I understand the cost is often a fraction of what it is in the US. Are you a traveling family that has had to weigh the cost/risk of travel vaccinations? What did you decide and how did you come to that decision? Are you traveling soon and still confused and need more information? Here are a few resources that we have found very useful. Check out these resources and see a travel clinic well before your departure date because some of the vaccinations require multiple doses over several weeks. Centers for Disease Control and Prevention – Check out the travelers health section where you can select your destination and get information on what vaccinations and immunizations are recommended. Sick on the Road – Lots of travel health tips and advice complete with real world stories. It’s important to understand what the risks are in the places you will be traveling to and what options are available to you. Then based on that information make an informed decision for yourself or family. Be confident in that decision and don’t dwell on it or second guess it. Just enjoy your time exploring the world. We had all our immunisations in Thailand earlier this year. Costs were $3000 in Australia vs about $600 in Bangkok. We went to the Thai Travel Clinic. You can google them and their costs are on their website. Note that they close at 4pm and you can be there for a while so go earlier in the day. No need for an appointment. We had Hepatitis (3 ppl), Rabies, JE, typhoid and we got malaria tablets for 5 people for that price. Just meant we had to go to the clinic on days 0,7 and 21. We got this info from another family who had their small children vaccinated there too. Happy travels!! Tracey – Life Changing Year recently posted..A Note To All The Hackers, Spammers and Internet Losers. Get Off My Damn Website! Thank you Tracey! This is great information. We may be going to Thailand as well so we will definitely consider visiting this clinic or we will try to find something in Indonesia where we will be spending most of our time. What a huge difference in cost! Their website is very informative as well. Thanks for passing this along and happy travels as well. Glad to see a new post over here and of course, thanks for the shout out. Posts like these, with detailed narrative of what and how you did things are the best way for travelers to learn how to plan. I also agree with your decision on rabies, especially because you have kids. I know it is not the cheapest vaccination. Looking forward to your future posts! Hey Phil! Vaccinations definitely are not inexpensive. Thanks to Tracey’s comment we may make a side trip to Thailand. More posts coming over the next few months. Hi Matt! Glad to know that you’re going to have another sabbatical, and from what I learned you will spend most of your time in Indonesia, am I right? I hope you’ll have a more wonderful trip and I also hope you’ll get all the vaccinations for your family. Hey Bama! Yes, we will be mostly in Indonesia but may take some side trips to Thailand and Singapore. We did get the rabies or JE vaccinations either. So far I feel good about the decision! If we get bit by an animal you can get the rabies vaccination after the fact. JE is rare, but if we end up spending a lot of time in a place where people are prone to contract it, we can always get the vaccination later.